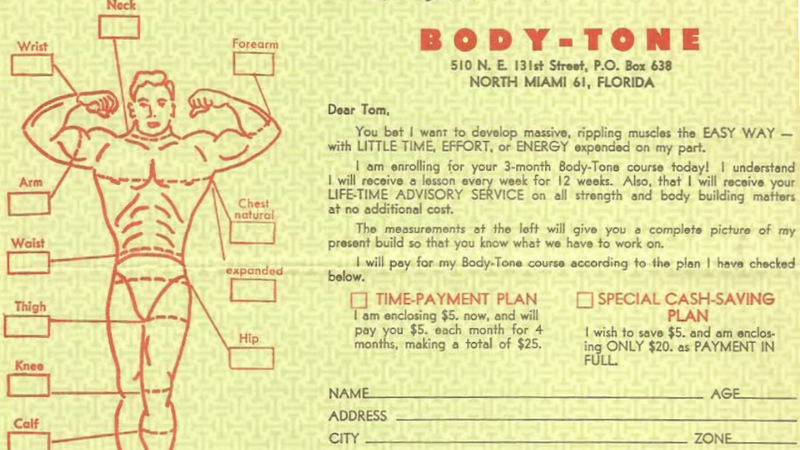 "I CAN GIVE YOU MASSIVE ARMS, BROAD SHOULDERS, AND A GIANT SIZED CHEST IN JUST FOUR WEEKS," the Body-Tone pamphlet promises. It is the "World's Fastest Strength and Muscle Building System". It cost $20 in the late 1950s, but today the program is available for free in the Stark Center Archives. I am ready to begin. 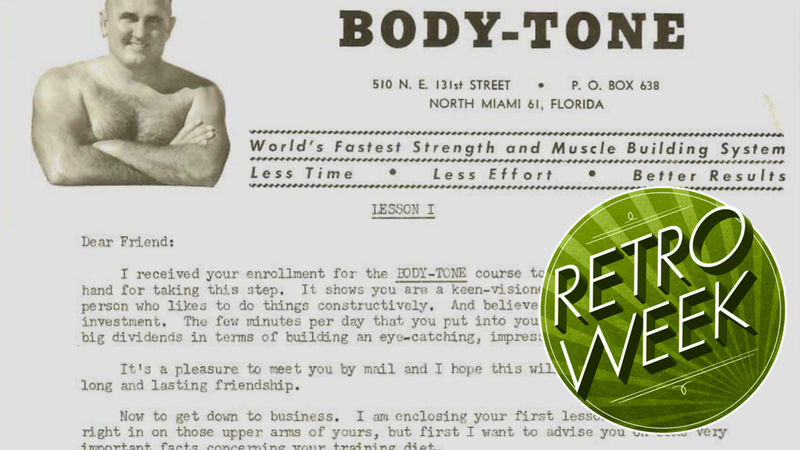 Back in the day, I would have learned about Body-Tone through a cryptic ad in the back of a magazine. Here's how it appeared in the December 1958 issue of Popular Science. After you wrote to this address, you'd get an envelope in the mail with three things. (Somebody saved theirs and it's available with original envelope on Etsy; God bless you Etsy.) First, there is a letter from Tom Buckley himself, who appears on his own letterhead, smiling and beefy. Then, nine pages of questions and answers on orange paper, slyly selling you the system. Finally, an enrollment form. You are to take 15 body measurements, write an essay on your current exercise routine and health status, and decide whether you want to pay all at once or in instalments. Translated into 2017 dollars, the program cost $US169 ($216) all at once, or $US42 ($54) in five instalments for a total of $US211 ($269). Question: What is the fastest possible way to make a muscle grow in both strength and size? Answer: Any muscle in the human body can be made to grow bigger, thicker, and stronger at the fastest possible rate merely by contracting that muscle just one time per day — but, by doing it as hard as you can — and, for a period of approximately 6 seconds. Question: At that rate you could increase your strength by 50 per cent in just a 12 week period, isn't that so? Answer: Absolutely. That is, if you do the single contraction every day. If you do it every other day, or even less, the rate of increase of your strength would be considerably slower. Question: Why can't I just do it myself without taking a Course? Answer: Well as a matter of fact you can. That is, if you know all the actions of the muscles involved and the points of attachment of each muscle. Usually, however, that is a subject which is taught only in college courses in KINESIOLOGY. Well, I'm sold. The first lesson promises to develop my upper arms, specifically my biceps, but before Tom Buckley will tell me about how to do that, he wants me to think about my nutrition. To get enough protein to build muscle, he says I should divide my body weight in pounds by 2.2 (hey, that's just converting to kilograms) and then eat that many grams of protein each day. For me, that's a mere 64g. This may sound low if you're used to the one-gram-per-pound rule of thumb from modern weightlifters, but it's actually a pretty good number: One gram of protein per kilogram of body weight. The average person needs about 0.8g/kg, and serious athletes 1.2 or more. I'm not sure what pre-cooked soybean granules are, but they sound a lot like TVP. TVP is made of soy flour, which I cannot find on its own, so I figure that will have to stand in for both ingredients. Then I just add some wheat germ, skim milk, a raw (pasteurised) egg and... wait a second, what's up with that yeast? Twenty grams in one heaping tablespoon doesn't sound very realistic; the highest number I could find online was 8g per level tablespoon. Anyway. I combine the ingredients in an Osterizer Classic (I do not have a Waring Blendor) and call my husband to the kitchen to taste it with me. 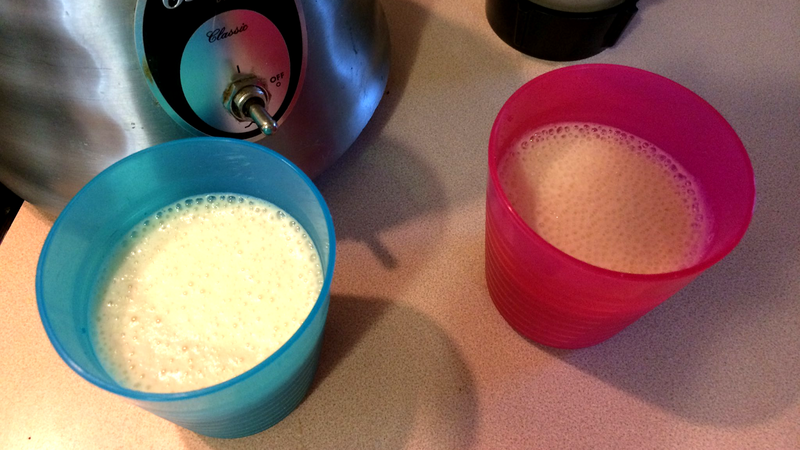 The result is a frothy, tasty drink that is very much like a vanilla milkshake. I call this a "Muscle Cocktail." Vanilla milkshake, huh? The soy granules didn't fully dissolve in the blender, or maybe that is the wheat germ I see floating around. Vanilla makes everything taste better, but why would you need two full teaspoons of it? Is there a nasty flavour to cover up? We take our first sips. I find it instantly awful: The liquid part is bland and watery, the flakes sludgey and gag-inducing. The vanilla does nothing to cover up the fact that it's like drinking a soup made of sawdust. So, what do you actually do in the world's fastest strength and muscle building system? 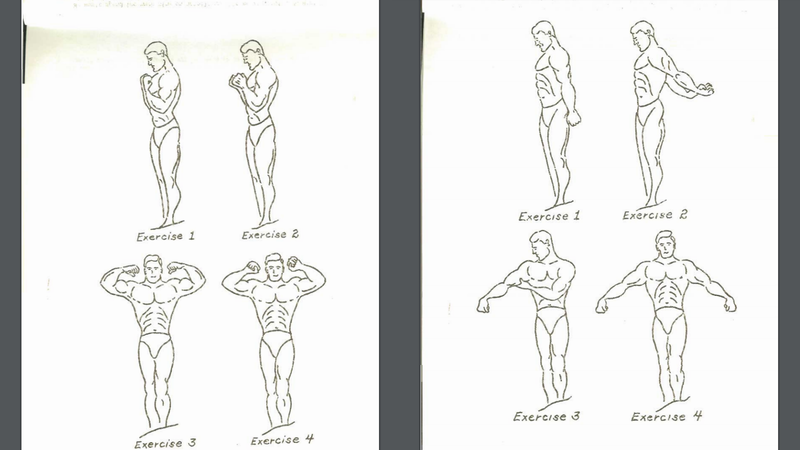 Each week you study an anatomical diagram of the muscles you are trying to build, and then do a handful of exercises that, as promised, each take six seconds. 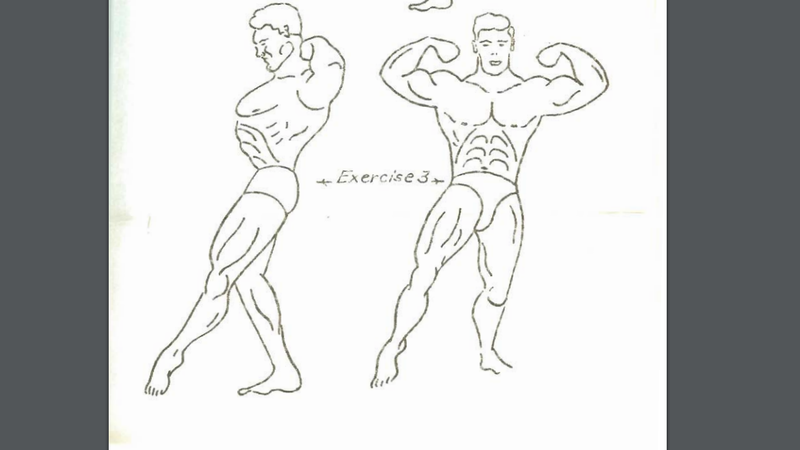 Now to flush the inner head, or short head of the biceps take a position as shown in Exercise 1. Notice the elbows are close to the sides. The fists are clenched, with knuckles facing away from the body. The arms are fully flexed. 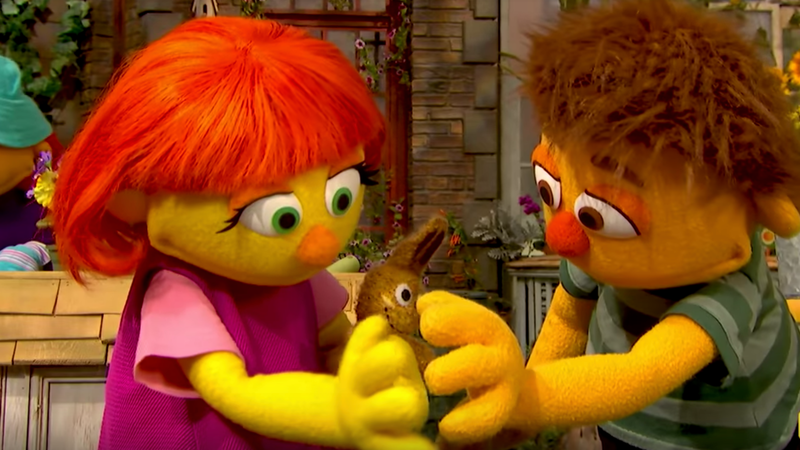 The head is bent down slightly. Now flex the arms real hard, then harder, harder, and harder until your fists and fore-arms start to shake. This should take about six seconds. 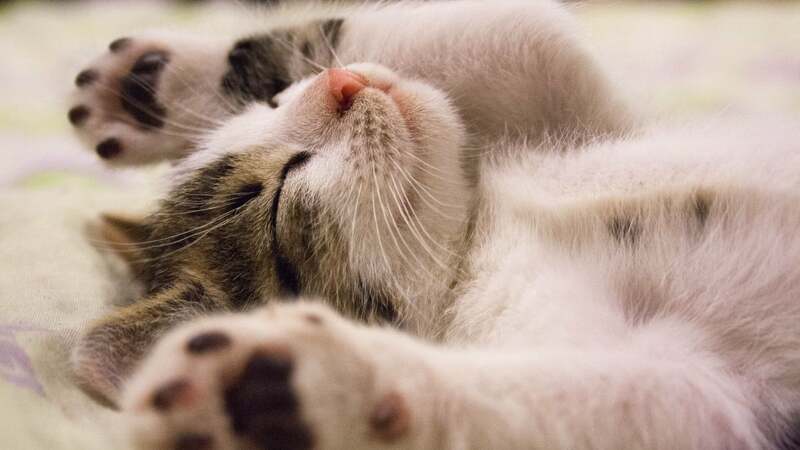 Now relax completely. I clench my muscles as directed, and within six seconds I'm feeling a burn. A few minutes later, I'm done with my exercises for the day, and my arms feel like I've just finished a hard workout in the gym. Could there be something to this theory? The next day, my biceps and triceps are just a little bit sore. Soreness isn't a perfect indicator of muscle growth or anything, but a completely useless exercise wouldn't bring on soreness. I am still sceptical, but impressed. By now those upper arms of yours should be "popping-out" real good. I'm pretty sure it isn't possible to see results in a day, or even the original timeframe of two weeks. The diagrams all show extremely well-muscled individuals, apparently free of body fat. No matter how good an exercise program there is, I suspect there's no way it's going to make me look like a Superman cartoon. When two men start jostling with each other the superior leg strength of one becomes immediately evident. And quite often it is the little fellow who manhandles the bully. I am thinking now of the situation where one man tries to throw the other fellow into a body of water. They grip at each other's bodies and use the legs for driving, balancing movements. Here the sheer total strength of one man against the other comes forth with complete disregard for any learned skills of combat. Once I know the exercises, I can run through the full workout in about 12 minutes. I do it standing in my kitchen, where the needed equipment is close at hand: A dish towel to squeeze for the grip exercises, and a chair for a few things that are seated. At one point I am supposed to thread a broomstick through the rungs of a ladder so I can pull down on a bar at three different heights. Instead, I just place my hands on high, medium and low shelves. And, yes, I'm still a little bit sore each morning. Not enough to be painful, but just a slight stiffness that feels like I had a good workout the previous day. Maybe I can become a muscled Greek god in 12 weeks. Some men develop fast, others more slowly. Some reach maximum development in two to three months, while others may take a year or more. You will quickly see which category you are in after the first few weeks. But Müller doesn't address Buckley's more drastic claims: Do you really improve by four per cent every week? And that means you can gain 50 per cent more strength in just a 12 week period, isn't that so? For those answers, we need to pop forward in our time machine to 1981, when John Atha of the Loughborough University of Technology put together this review of approaches to strength training (sorry, another paywall). He writes: "The idea that so trivial a training investment could yield such a sound strength return, and that years of dedicated resistance work, lifting weights totalling 1,000 or more tons each year, was needless effort, created tremors in the solid foundations of the strength establishment that, a generation later, have still barely settled." But the promises were not to be. Rather than a four per cent increase every week, later research adjusted the claims to a 1.8 per cent increase. Then researchers in 1960 "drew attention to the fragile structure of conclusions based on observations of 71 alternative ways of training only nine subjects". That still sounds pretty good, but the real nail in the coffin was this. Instead of reaching maximum strength in months or a year, as Buckley stated, it turns out people who do isometric exercises stop improving after two to five weeks. If you're fit to start with, you're on the two-week end of the spectrum. If you start out as a weakling, you might increase your strength by 10 per cent at first. But five weeks is your limit: More time on the program won't bring you any more gains. You're done. Well my friend, I hope you have enjoyed the course as much as I have enjoyed preparing it for you. ...may you continue to improve in strength, power, and physique perfection. Good luck! I'll keep doing these exercises a little longer, I think. The routine is an easy 12 minutes that works every muscle without breaking a sweat, so it's handy for days I can't get to the gym. I could stick the chart in my suitcase next time I travel. But the overall promises, of getting those massive arms and giant-sized chest, are hollow. I wonder how many people wrote to their friend, good ol' Tom Buckley, for a refund under his money-back guarantee.